John Hammond was a son of James and Martha Hammond. John Hammond was born on 27th August 1894 in Desertmartin, Magherafelt, County Londonderry. John was one of 11 children. The family worked on the farm. It is believed John went to live his parents in Desertmartin. John Hammond enlisted in Enniskillen in August 1915.He was bat-man to Captain M A Robertson. Private John Hammond was serving with the 10th Battalion of the Royal Inniskilling Fusiliers when he was killed in action on the first day of the Battle of the Somme on 1st July 1916. 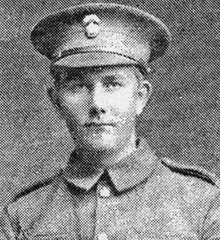 His brother, Private Joseph Hammond, was also killed on that day at the Somme.